You’d think a period piece concerning the women’s suffragette movement in the U.K. would be an uplifting slam dunk. I mean championing a women’s right to vote is not exactly a controversial notion unless, according to the movie’s closing credits, you’re Saudi Arabia. It’s the kind of accessible femininism that everybody can get behind. Unfortunately what should have been an unimpeachable drama becomes a tedious chore with a mangled narrative that thwarts an inspiring true story. The screenplay has fashioned the UK suffrage crusade around a fictional group of working class women. 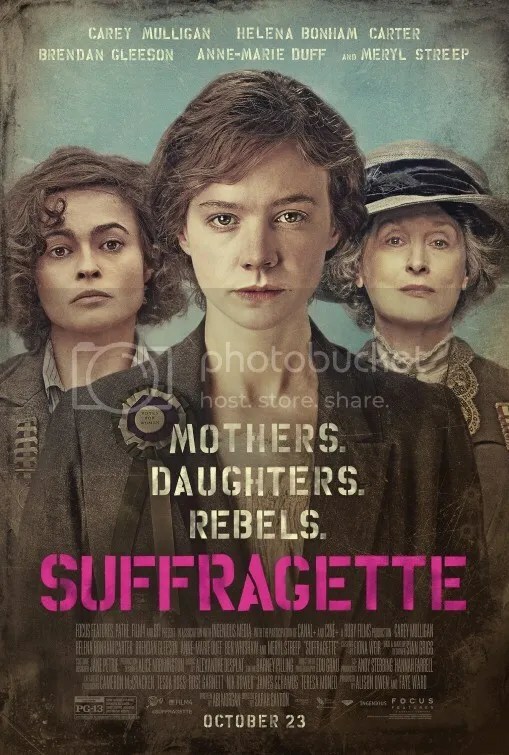 If your knowledge about their struggle is centered around actress Glynis Johns singling “Sister Suffragette” in Mary Poppins, then this movie should be quite an education. Yes they do in fact wear those sashes and bonnets, but they aren’t interested in peaceful protest. These women are violent. First it starts with throwing rocks at store front windows. Then it’s on to blowing things up, first mailboxes, then the prime minister’s home. Meryl Streep pops up briefly to inspire the masses as a leader of the British suffragette campaign. And by briefly, I mean if you use the restroom, you’ll miss her. She plays political activist Emmeline Pankhurst, one of the few roles literally based on a real person. Women have been fighting for more representation in Parliament for some 50 years, she laments. Civil disobedience has now given way to a radicalized cause prone to violence as the sole route to change. She inspires Maud Watts (Carey Mulligan) to go from law abiding housewife to rabble rouser. “We break windows, we burn things, because war’s the only language men listen to” she cries. A great actor can rise above conventional, even bland, filmmaking. I thought this as I watched Carey Mulligan in Suffragette. She is convincing as Maud, a working wife and mother, who is indirectly recruited into the movement. This occurs when she is asked to read a speech detailing horrible conditions at the laundry to a cabinet committee, on behalf of her co-worker Violet (Anne-Marie Duff). Maud does this because her friend’s face is badly bruised after having been beat by her husband. It would seem that condition would actually lend more power to Violet’s words, but that idea is never even considered. Carey Mulligan as Maud is barely concerned about the vote at the beginning, but her transformation into a raging extremist becomes a compelling character arc. Maud’s conversion from mild mannered housewife into left wing revolutionary is effective in Carey Mulligan’s hands. She transcends the material. The same cannot be said for the rest of the cast. The film is filled with clichés not people. Meryl Streep’s part is too small to make a difference. Helena Bonham Carter, Anne-Marie Duff and Romola Garai all portray fictional composites that represent types. Natalie Press, on the other hand, is the very real Emily Davison. It’s unfortunate she’s more of a plot device than a person. She provides a climax of sorts. Oh but the men fare even worse. Ben Whishaw plays Maud’s husband as an unforgiving man who’d rather kick his wife out into the street and give up his only child for adoption, than have a conversation with his wife. Maud’s boss (Geoff Bell) is a snarling sexual predator and shop-floor tyrant that does everything but twirl his mustache. Meanwhile the police bash lady demonstrators senseless with batons. Suffragette is a pedestrian account that fails to be incisive. The screenplay by Abi Morgan paints their experience in broad strokes. These are supposed to be our mothers and daughters, but they aren’t human, they’re shortcuts to character development that short change a powerful saga. It’s interesting to note that Abi Morgan also wrote The Iron Lady which was another narratively weak script. Maud loses her husband, child, job, home, basically everything in her life. She’s even thrown in jail and force fed with tubes in a particularly hard to watch scene. On paper, this chronicle should’ve been a soft sell for today’s viewer. It’s the ultimate indignity to the struggle of these brave women that you unwittingly start to question Maud’s decisions. Was becoming a domestic bomber and arsonist really the correct path? This shouldn’t happen in a tale about courageous women fighting for equal rights, but strangely it does. Jack lives with Ma in a single-room that contains a bed, a bathtub, a small kitchen, a wardrobe, and a TV set. This is Jack’s world. It is all he has ever known. He has never set foot in the outside world. As such, he believes that Room and everything it contains are what’s real. The breadth of nature is an illusion that exists only on television. Ma indulges these fantasies because this is their life. She loves Jack with all her heart and provides a comfortable atmosphere in the most honorable manner she can. She ensures he lives a fulfilling life — physically active, mentally sound, healthy diet, limiting TV-watching time and good hygiene. She bakes him a cake to celebrate his 5th birthday. From that point on, however, things are about to change. Director Lenny Abrahamson is an Irish filmmaker who caused indie waves in the U.S. in 2014 with Frank, a somewhat inscrutable rock & roll tale about a band whose lead singer permanently wears an oversized fiberglass head. Where that movie fabricated a setup that was avant garde and somewhat inaccessible, Room is totally the opposite. Room details the touching relationship between a parent and her child under difficult circumstances. Here Abrahamson deftly handles the scenario, keeping it from succumbing to the easy extremes of oppressive cruelty or overt sentimentality. The environment would seem to be fairly restrictive at first, but the claustrophobic setting gives way to a boundless examination of human emotion. I dare say there is surprising nuance in the ways these conversations with Ma and Jake play out. Little 5 year old Jack is the film’s cheerful narrator. As embodied by Jacob Tremblay as her son, he radiates utter naiveté. Completely trusting and sincere, he is a wide eyed innocent. A boy with hair that has never been cut, the source of his strength he says. He has an unexpectedly sunny disposition as he explains his limited understanding of the world to us. It would be an incredible performance for anyone, but particularly impressive coming from such a young actor. He undergoes a transformation of character. That subsequent cognizance is so perfectly realized, I was floored. Brie Larson is no less extraordinary as Ma. At 25, she too registers a surprisingly mature performance as a mother with infinite devotion for her son. Room is based on the 2010 book of the same name by writer Emma Donoghue. The Irish born-Canadian citizen adapted her own novel to pen the screenplay. In it she has done something quite remarkable. This is a meditation on love, to ponder how a parent takes the best of a bad situation and makes it presentable for their child. Rather than exploit the experience for the obvious emotional pain, she celebrates their close relationship. Impressively it doesn’t succumb to mawkishness either. There are indeed scenes that pack a wallop, but the feelings are earned organically as the chronicle progresses. I was tearing up at various points throughout, almost sobbing at one point because the intensity of what was happening was too much to bear. As the narrative develops there’s suspense, excitement, tears and joy. I haven’t even revealed a major component of the story. I admire the production’s finely crafted restraint and have acted in kind. However know this, happiness and terror exist side by side. Author Emma Donoghue has found a unique way to detail the tender bond between a mother and her son. 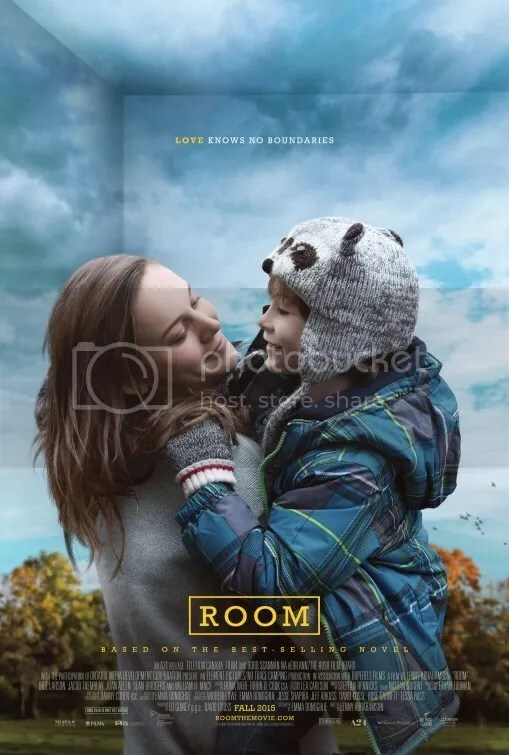 Room‘s exploration of love is so heartbreakingly original, it’s cathartic. Tom Hanks and Steven Spielberg are back. The pair have a history of working together. You’re probably aware they have collaborated before as actor/director, but this is actually their fourth movie together. Saving Private Ryan (1998), Catch Me If You Can (2002), and The Terminal (2004) were the others. 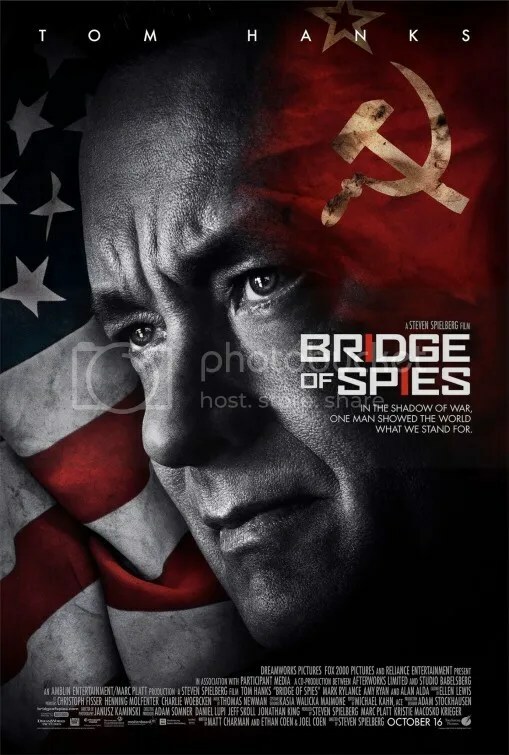 With Bridge of Spies, the two are truly in their element. American James B. Donovan is an insurance lawyer. He’s appointed to defend Rudolf Abel (Mark Rylance), a man arrested as a Soviet spy. His peers in the Brooklyn Bar Association have chosen Donovan for this thankless task. He assisted in the 1945 Nuremberg trials of Nazi war criminals so it’s not completely out of left field. The time is 1957 at the height of the Cold War and American hatred toward communists is at a fever pitch. Which is why now, more than ever, Abel must receive the appearance of an equitable trial. Donovan takes his responsibility very seriously much to everyone’s surprise. This includes the judge, the prosecuting attorney, his firm, even his own family. His efforts to seek acquittal are roundly greeted with anger and derision. Tom Hanks personifies the lawyer as a do-gooding crusader, not unlike Gregory Peck as Atticus Finch in To Kill a Mockingbird, another idealist. The thing is, the government’s case against Abel is overwhelming and indisputable. The fact that the evidence points to the defendant’s guilt in this incident is kind of beside the point. Everyone deserves a fair trail. The noble campaign in defending an unpopular defendant is similar. Tom Hanks exudes dignity and class as an ordinary man thrust into extraordinary circumstances His unfailing commitment to doing the right thing, despite widespread opposition, is almost too good to be true. And yet he radiates such sincerity that Hanks captures our empathy where we warmly embrace this man. We champion his cause, if not his client. Actor Mark Rylance inhabits the role of the Soviet spy as sort of an enigma. He doesn’t say much and what he does say is without a Russian accent. He displays a calm, even carefree demeanor. That straight-faced line gets repeated a few times, always to amusing effect. The screenplay penned by Joel and Ethan Coen along with Matt Charman crackles. Mark Rylance (The Other Boleyn Girl, Anonymous) is an English theater actor, unfamiliar to mainstream audiences. That is until now. This performance show get him some justified attention. Now if that were the whole plot, it would still have been a good one. Except the saga isn’t over. That’s only half of it. A few years later in 1960, Francis Gary Powers (Austin Stowell) is an American whose U-2 spy plane is shot down while flying a “reconnaissance mission” over Soviet Union airspace. The CIA sends Donovan abroad to negotiate the release our spy in exchange for theirs. The complications surrounding the tricky negotiations don’t rely on breathtaking action but they are fascinating nonetheless. Spielberg takes some liberties with events and reactions. For example, Donovan’s family did receive threatening letters in real life, but his home was never riddled with bullets by an angry citizen. I guess that is within the realm of dramatic license. Not too objectionable. Steven Spielberg directs with the confidence of a master. He has a fondness for historical epics (Amistad, War Horse, Lincoln). He takes what could have been a dull tale of governmental machinations and imbues it with the necessary amount of reverence and flash. This is compelling stuff but with a measured take. By taking a pivotal Cold War moment that was shrouded in secrecy, he deftly handles the problems of a perplexing storyline and distills it into something entertaining to watch. It’s the turn of the 20th century and the Victorian era is coming to an end. Edith Cushing is a would-be author of ghost stories in Buffalo, New York. She hopes to get published. She meets a enigmatic English aristocrat who likes her writing and, by extension, her as well – naturally. Unfortunately her Father doesn’t approve of the man – naturally. One thing leads to another and Edith’s heart is broken – as you would expect. There’s a lot more but you get the idea. Crimson Peak is the latest from the mind of Guillermo del Toro, the artiste behind Hellboy, Pan’s Labyrinth and Pacific Rim. The chronicle employs spooky aspects but it hews a lot closer to the affairs of the heart than outright scares. You see the ghosts are a metaphor. Edith even explicitly tells us this point regarding her own work. The gothic romance is exquisitely ornate in atmosphere, but completely routine in story. Reviewers are fond of tossing around descriptive phrases like “gothic fiction” to describe a film, but what defines “gothic” anyway? A personifying trait is the old foreboding mansion in a state of decay, a haunted house if you will, that harbors a terrible secret or serves as the sanctuary for a questionable character. The genre is generally traced back to The Castle of Otranto (1764) by Horace Walpole, but was popularized by authors including Ann Radcliffe, Bram Stoker, Edgar Allan Poe and Daphne du Maurier. Some of the great classics of 19th-century literature—Frankenstein, The House of the Seven Gables, Jane Eyre, and The Hunchback of Notre Dame partly reference the style. Horror elements are often present, but a sophisticated romanticism usually informs the subject. Movies like Rebecca (1940), The Innocents (1961) and The Others (2001) are the benchmarks in the cinematic world. Crimson Peak aspires to those standards. It benefits from a first-rate cast. Although they’re all playing archetypes you’ve seen many times before. 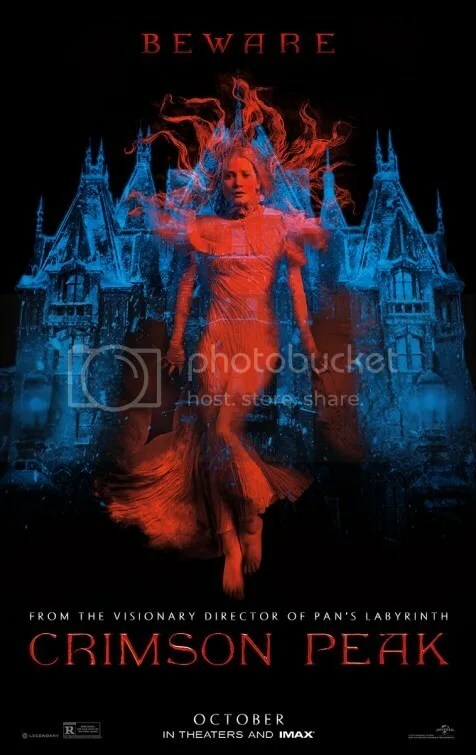 Mia Wasikowska is the quintessential woman in distress, as is de rigueur for a gothic romance such as this. She was the star of 2011’s Jane Eyre so she can plays this role in her sleep. Tom Hiddleston is the suitably mysterious Sir Thomas Sharpe, the dapper stranger for whom she falls. Jessica Chastain is Lucille, Thomas’ overprotective sister. She’s a devoted devil in full tilt “Mrs. Danvers” mode. If Thomas’ odd behavior didn’t serve as a warning sign to innocent Edith, then Lucille’s creepy disposition should have been an outright slap in the face. Charlie Hunnam is a clean cut, prospective suitor that would appear to be the more sensible choice and Jim Beaver is Carter Cushing, Edith’s wealthy father. The presentation is meticulously detailed, employing a veritable smorgasbord of gleefully elaborate costumes, lush set design and a strings-infused score by Fernando Velazquez. They dress up an R rated production that occasionally falls victim to excess. The up-to-the-minute digital effects sometimes distract from the sumptuous proceedings, rather than assist them. The inky floating specter of her dead mother repeatedly pops up to warn her to avoid Crimson Peak. Wouldn’t you know that’s exactly where she ends up. Go figure. The screenplay by del Toro and Matthew Robbins won’t win any awards in the originality departement. The surprise is that the plot is indeed conventional right through to the end. I was shocked by how utterly derivative the story truly is. Was that the twist? My eyes were delighted however and I suppose that counts for something. The house is bewitchingly decrepit. More questions. Why is non-stop debris constantly falling through the ceiling in Allerdale Hall? Why doesn’t someone call the roofer? Don’t think. Just watch as the fashion, music and mood gorgeously feast on a feeble script. Crimson Peak is all beauty, no brains. Aaron Sorkin is an amazing writer. The Oscar winning scribe behind such beloved titles as A Few Good Men, The Social Network, and Moneyball has an ear for dialogue and Steve Jobs, the movie, is no different. The author fashions the story as a play in three acts. Just don’t call it a biopic. The screenwriter has openly acknowledged it as “impressionistic”. The production is more of an imagined portrait as directed by Danny Boyle. We follow the titular icon backstage at the presentation of three key unveilings in his life: the introduction of the Macintosh computer in 1984, the debut of the NeXT computer in 1988 and the launch of the iMac in 1998. Structurally it’s quite innovative. The narrow scope gives the drama a core with which to delve into the personality of the man. But at the same time that fixation is rather limiting too. It’s an isolated misrepresentation. 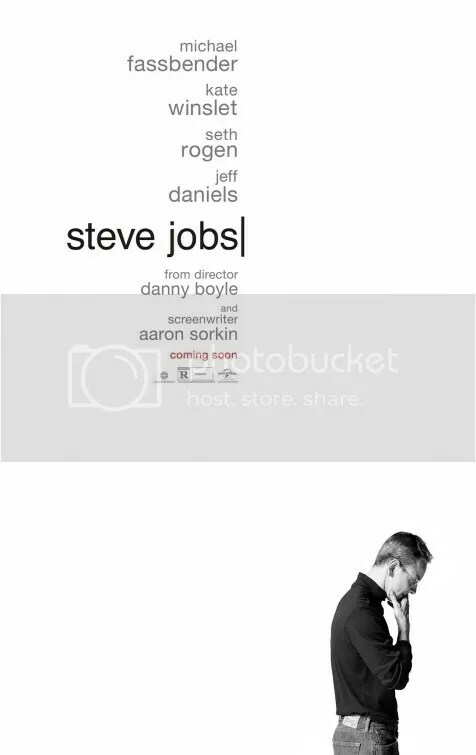 The screenplay is adapted both from Walter Isaacson’s biography Steve Jobs as well as interviews conducted by Sorkin. The dialogue isn’t based on actual conversations but more of an imagining of what might have been said, given what ultimately occurred. For example, Steve Jobs has a histrionic shouting match with Apple cofounder Steve Wozniak (Seth Rogen) right before the iMac introduction. This happens publicly in an auditorium with many apple employees looking on. Given Steve Jobs’ carefully orchestrated persona, this publicly embarrassing scene doesn’t even have the ring of truth. To make matters worse, we’ve already heard this same complaint from Steve Wozniak before in each of the previous two acts. Which brings me to my next point. The feature is repetitive. Their open argument concerns Wozniak’s desire to have Jobs publicly acknowledge the Apple II team and their contribution. Every time Wozniak shows up, it’s to whine about the same agenda. In the first section, it’s engrossing. In the second, it’s mild déjà vu. By the third it’s tedious begging. He’s like a broken record. Ditto the interactions between Steve Jobs and Chrisann Brennan (Katherine Waterston), former girlfriend and mother of his child, Lisa. Chrisann drops in at inopportune times to plead with him. She rightfully wants him to support his biological child. “Your Apple stock is worth $441 million dollars, and your daughter and her mother are on welfare.” It’s kind of unbelievable how many people freely tell this powerful guy off. Yeah, he’s not a nice guy and the script doesn’t pull many punches. This is Steve Jobs the jerk. A brilliant manipulator of people, but still a jerk. The first act is a fascinating, albeit cold, conversation between people. These include Kate Winslet as Joanna Hoffman. In real life she was a marketing executive but functions more as a personal assistant here. There’s Andy Hertzfeld (Michael Stuhlbarg), one of many engineers on the original Apple Macintosh development team. He is given center stage when the computer won’t say “hello” in a robotic voice. Steve Jobs bullies Andy Hertzfeld into submission. The scene is amusing but it feels apocryphal. There’s also Apple CEO John Sculley (Jeff Daniels), a mentor of sorts who dispenses wisdom like a father figure. The verbal sparring between the two is a high point. That Macintosh section is captivating. The NexT computer portion, decent. But the iMac launch is where the narrative becomes exhausting. The primary gist throughout Steve Jobs isn’t business. It’s his relationship with Lisa, the daughter he refuses to accept. She pops up repeatedly, played at different stages by Perla Haney-Jardine, Ripley Sobo, and Makenzie Moss. Their bond forms the climax. The chronicle has so little to do with the successes of his profession. In fact his most celebrated gadgets (iPhone, iPod, and iPad) aren’t even mentioned), Neither is the Pixar company. Steve Jobs became a multi-billionaire as its majority shareholder, after the Walt Disney company bought it in 2006. Sorry this movie ends in 1998. Steve Jobs benefits from a crackerjack screenplay. The lightning fast dialogue, particularly in the first two acts is quite mesmerizing. It’s a veritable inundation of words, a theatrical tour de force for its star Michael Fassbender. Despite his lack of resemblance, he gets the driven spirit of the character. Who cares that little, if any of these conversations really happened, right? The attitude behind what he did is rooted in fact. I won’t fault the script for inaccuracy, but I will fault it for entertainment. The center of attention is a man who must make amends with his daughter. For a man so admired for the things he created, it is a regrettable misdirection of focus. The climatic discussion invented for the dramatization. For most of the runtime, Aaron Sorkin’s dialogue zings. Characters exchange words back and force with the crack of a whip. It’s a masterfully composed conceptual play. I easily admire it for that. It’s the artificiality and narrow focus that is difficult to love. It’s always a treat when a thespian has the opportunity to really act. Andrew Garfield hit the big time with a supporting part in The Social Network back in 2010. The attention he drew got him the lead in The Amazing Spider-Man reboot as well as its sequel two years later. I didn’t care for those movies. They were little more than CGI fests and they did nothing to show off the talent he displayed in his earlier work. Now he’s back to his indie roots with this well made production about the housing market crash of 2008. I suppose the same could also be said of Michael Shannon. He starred as the main villain in 2013’s Man of Steel. The difference is that the Superman picture was sort of an exception to the sheer number of indie films (Revolutionary Road, Take Shelter, Mud) he normally does. 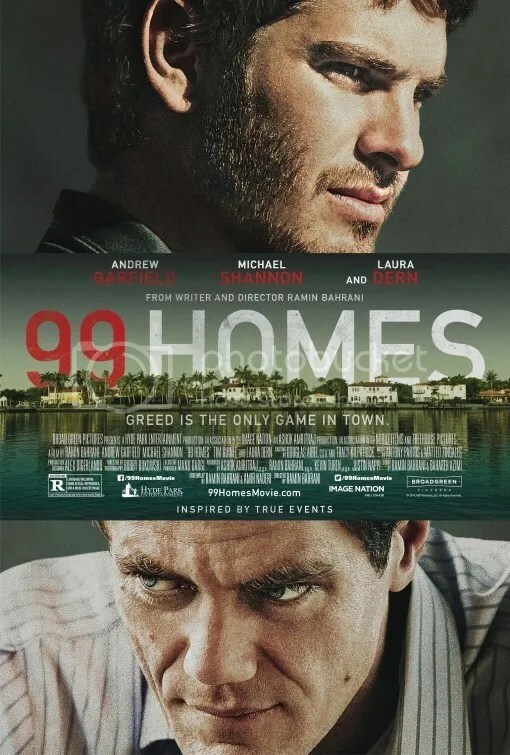 99 Homes is a social issue drama concerning Dennis Nash (Andrew Garfield) and his family when the bank must foreclose on his home. The blue collar single dad, his young son (Noah Lomax), and his mom (Laura Dern), are suddenly without a place to live. The setting is Orlando in the wake of the 2008 subprime-mortgage crisis. Real estate developer Rick Carver (Michael Shannon) is in charge of the eviction. He takes advantage of these foreclosures by swooping in and buying up these homes at a profit. He is an opportunist who is insensitive to, even critical of, their plight. “Dennis, you borrowed $60,000 and didn’t’t pay it back — ain’t that stealing?” he chides. Michael Shannon clearly has the juiciest role. As a hissable villan, he gives the individual life, relishing in his personality where compassion is a weakness. His “greed is good” ethos would make him a good buddy of Gordon Gecko in Wall Street. “Don’t get emotional about real estate, ” he warns. They’re boxes. Big boxes, small boxes. What matters is how many you’ve got.” Indeed he tosses off words of wisdom that deserve to be oft-quoted lines. He’s the proverbial person you love to hate. But is he truly the villan or is the system itself? The temperament of Andrew Garfield’s Dennis Nash isn’t as extreme, but his construction worker has the most compelling character arc. His sweet, gentle demeanor is engaging for the opposite reason. But his decency has a price. As his desperation increases, he caves to darker impulses to provide for his family. Together Michael Shannon and Andrew Garfield provide a captivating study of personalities that interact over an ethical and moral divide. This harrowing chapter of recent history mines socio-political themes for genuine human drama. Director Ramin Bahrani co-wrote the script with Amir Naderi from a story by Bahareh Azimi. The director rachets up the tension and takes what could have been a dry subject into a powerful narrative. Things get intense and watching people lose their homes can be pretty uncomfortable to watch. There’s a surprising amount of suspense in the simplistic but well acted character examination. Unfortunately the ending lacks the punch of the rest of the film. While it entertains, it also informs, giving us a window into how reckless monetary policies contributed to the the financial recession of 2007–09. Andrew Garfield and Michael Shannon portray the human and often painful side of what happens when the economy fails. 99 Homes is the intimate side to an epic saga. The tale was famously told onscreen once before in James Marsh’s Man on Wire, an Oscar winner in 2009 for Best Documentary Feature. On the early morning of August 7, 1974, French high-wire artist Philippe Petit walked a tightrope between the Twin Towers of the World Trade Center. He completed the death-defying stunt 1,350-feet above the ground, making 8 passes on the wire for 45 minutes. The story behind this unauthorized feat was a carefully planned exploit that he referred to as “le coup”. At first glance, Director Robert Zemeckis (Back to the Future, Who Framed Roger Rabbit) might appear to be an odd fit for this fairly introspective little dramatic piece. But upon closer inspection, the concept doesn’t seem like such a random subject for the director. This is the saga of a dreamer, and as such, it feels like a labor of love for the wildly successful auteur who helmed Forrest Gump. The cinematic valentine comes across as both an ode to the idealistic spirit of Philippe Petit as well as a tribute to the memory of those impressive buildings that once towered above New York City. A large part of the picture is merely setup to his celebrated act. The planning and organization of the caper is presented with all the anticipation of a heist. Robert Zemeckis frames the movie with charismatic actor Joseph Gordon-Levitt as the similarly charming Petit speaking right into the camera while atop of the torch in the Statue of Liberty. Petit narrates his chronicle. That’s a whimsical touch. I suppose Zemeckis makes all of the prelude as interesting as possible, but it’s not unlike someone clearing their throat before giving an oratory address. Zemeckis surrounds Gordon-Levitt with a colorful cast of accomplices. 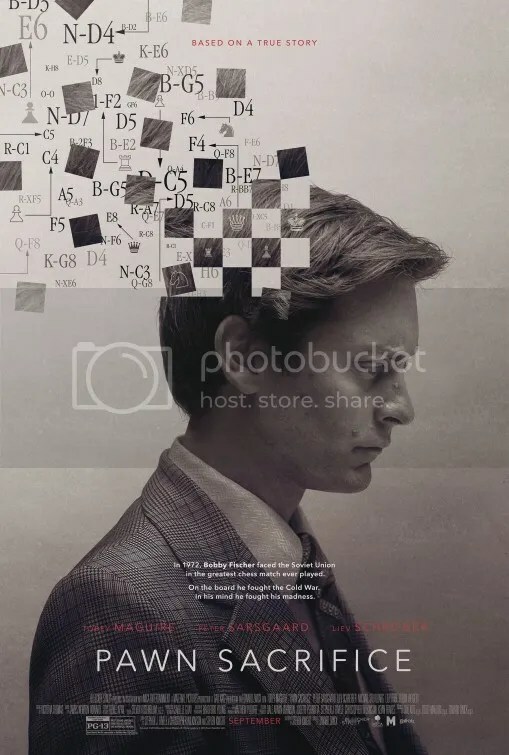 These include a photographer portrayed by Clément Sibony and a math whiz played by César Domboy. There’s also James Badge Dale as an American who speaks French, Steve Valentine as an American admirer with a WTC office, and Charlotte LeBon as a fellow French street performer/love interest. Ben Schwartz and Benedict Samuel are the final two conspirators. To be honest I couldn’t tell you what purpose they serve. Oh and there’s Ben Kingsley as Papa Rudy, a circus performer who inspires Petit in his native France. 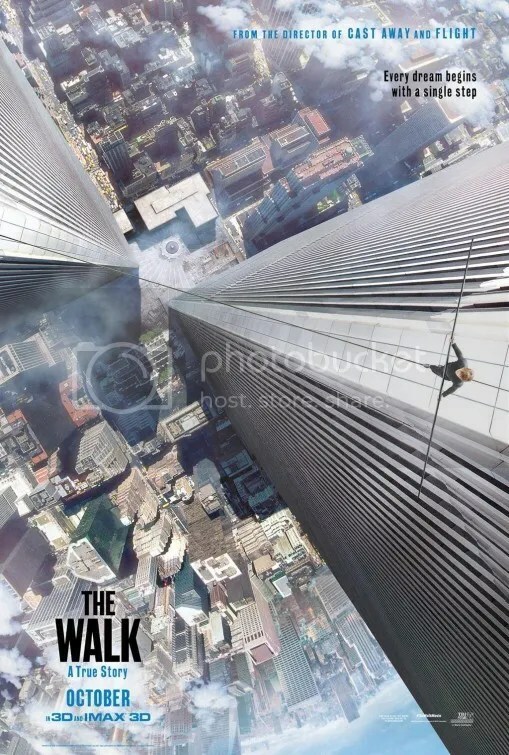 Like the recent Everest prior to this, The Walk debuted exclusively in 448 IMAX 3D theaters a week before its wide release. What could have been a gimmick becomes a fundamental component of the moviegoing phenomenon. This may sound like hyperbole, but I don’t think I’ve ever seen a film that utilized 3D and IMAX more perfectly than this one. The spectacle is nothing less than revelatory. I’m not saying the first half is expendable, but compared to the spectacular climax, it pales in comparison to the realism of the tightrope performance. You actually suffer the dizzying vertigo first-hand. The experience truly illustrates the danger of Petit’s achievement. This will scare the heck out of you. The technology elevates the sensation into something unforgettable. Creepy twins? Check. Domineering mother? Check. Frightening masks? Hissing cockroaches? A newly acquired pet? A priest? A cemetery? Cornfields? Plot twist? All present and accounted for. 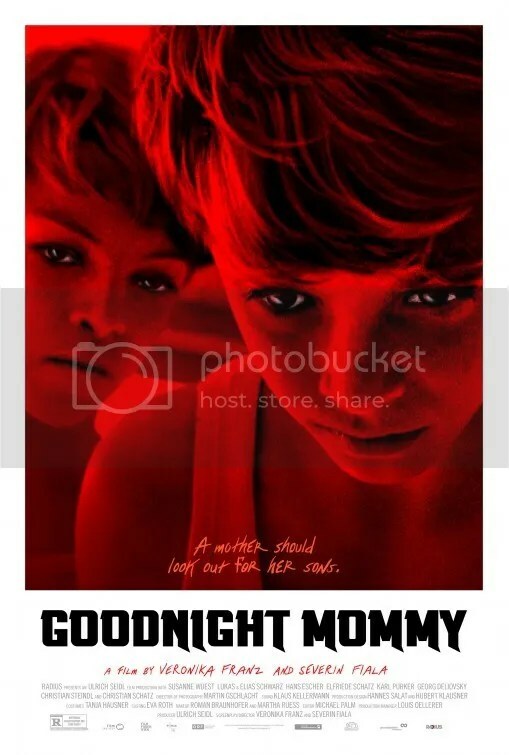 Goodnight Mommy contains some timeworn horror movie tropes, but instead of relying on clichés, it elevates the formula. The sampling synthesizes these elements into something entirely new and surprisingly innovative. Horror, arthouse cinema or psychological thriller, it’s all of these and more. I dare say within its framework, I faced a small handful of the most uniquely disquieting images I have ever seen. You can’t unsee these things. The concepts are creatively unsettling. Goodnight Mommy is the first narrative feature from filmmakers Veronika Franz and Severin Fiala. Ever since it had its world premiere at last year’s Venice Film Festival, the movie has built up a solid reputation of positive buzz. In September it was even submitted as Austria’s 2015 Oscar entry for Best Foreign Language Film. Flashback: fellow countryman Michael Haneke’s Amor won the award for Austria back in 2012. Interestingly Goodnight Mommy actually recalls the chilly isolation of Michael Haneke’s work, particularly with his Funny Games. Even the similar setting, a gorgeous estate by the lake, is incongruously tranquil for a horror flick. The writer-director team of Franz and Fiala take the sacred bond that exists between a mother and her children and shatters it to pieces. In their deconstruction, the chronicle plays out slowly, but at the climax, the dysfunction reaches a boiling point. Elias and Lukas are nine-year-old twin boys enjoying the summer in a modernist lake house made of steel and glass. Things seem fairly idyllic until mother shows up. Father is not in the picture. Mother’s appearance is obscured, her face wrapped in bandages, apparently the result of some facial surgery. She is a television presenter so perhaps the procedures were cosmetic. Regardless, her presence now vexes the children. She regresses into more irritable and oppressive, almost malicious, behavior. Is this woman their mother or is she an impostor? The boys have their doubts. What follows is an exploration of identity and trust. To give any more plot details would be to spoil the delight of discovery. Oh and believe me, this spine-chiller has a few shocking developments. The drama travels down a twisty path that grows ever more grotesque. The descent is so gradual that for most of the duration I was completely on board. The eerie trip mostly relies on psychological horror. If the directors make an error, it’s that they ultimately show more than they should. The flirtation with gore is enough. By the end, the plunge into Grand Guignol crosses the line. Only once, okay maybe twice. The impropriety betrays the dominant milieu of the picture. In this genre, what often separates the wheat from the chaff is the visual lexicon, that is – the discernible style of the director which is then boldly captured by the cinematographer. Here they artfully flaunt a narrative that manifests anxiety. The dread is palpable. The fact that the ambiguous story is created without much clarification intensifies the air of disorientation. Granted there are a lot of red herrings that purposefully mislead the viewer in ways that don’t always play fair. I still have no idea what that pizza delivery was about. But in a production such as this, the misdirection only heightens the unease. The script skillfully undermines the strength of the familial bonds we hold dear. I won’t soon forget the experience. I just have one nagging question: Why are the Red Cross volunteers in Austria so aggressive? The Martian is the latest movie in a tradition that looks at space travel with a serious eye. I’m talking about recent favs Gravity and Interstellar. The comparisons to Interstellar are especially pertinent. Aside from the astronaut subject matter, both also feature Matt Damon being stranded on a planet (this time as a good guy), and each highlight Jessica Chastain as one of the featured players. While the corresponding actors link this closer to Interstellar, the human marooned-in-space tale is much more aligned with Gravity. Matt Damon stars as a proficient botanist left behind on Mars when his squad flees a dangerous storm. You want comedy? You’re in luck, because there’s a lot of it. It’s a tribute to Drew Goddard’s adaptation, that a narrative can still find humor in the the face of very grim circumstances. Are you taking notes Christopher Nolan? This is Director Ridley Scott’s most celebrated film since American Gangster in 2007. It’s also his funniest loosest space epic yet. Alien and Prometheus were downright dour. The hilarity lightens the mood. Gravity was somber. Ditto Interstellar. The Martian, by comparison, is a laugh riot. The Martian is a much more audience friendly film. Surviving against all odds is the clear through line. This is a feel-good production that promotes the triumph of the human will. But its accessibility goes deeper than that. For one thing, we’ve surrounded Matt Damon with a stellar cast of characters so he’s not required to shoulder the entire narrative alone in the same way that Sandra Bullock needed to with Gravity. Or, if we really want to be accurate, like the modern day Robinson Crusoe of Tom Hanks in Castaway. Granted, that wasn’t about space, but the thematic analogy is particularly apt. In addition to Chastain, Damon is joined by Michael Peña, Kate Mara, Sebastian Stan and Aksel Hennie as his Ares 3 crew. They certainly don’t act like brainy scientists. They crack wise like they’re on a sitcom. Actor Michael Peña has elevated this archetype to an art form. Meanwhile Jeff Daniels, Kristen Wiig, Chiwetel Ejiofor, Benedict Wong and Sean Bean are part of ground control on earth. Though much more business-like, they have their lighthearted moments too. Donald Glover, you’re wanted on set. The picture is rooted in science. As in Andy Weir’s novel on which this is based, we have heaps of technical jargon. The words are creatively tossed out like grenades. In a story with a rather straightforward plot, they help create an intellectual mood. Star astronaut Matt Damon talks to himself, and by extension the audience, constantly. He’s fond of explaining what he’s currently doing, and what he’s going to do. He keeps meticulous video logs as well. I suppose these expository conversations are necessary so we can understand what’s going on. It’s just that the spoon-fed information reminds us that we’re watching a movie and not eavesdropping on the way these things would play actually play out organically in real life. The chronicle often shifts back to earth and the drama playing out down there as well. We are privy to the minute details and bureaucratic loopholes that would come into play once NASA discovered their man was still alive. The Martian is an unabashed crowd pleaser. Once Matt Damon realizes he’s been abandoned by his flight crew, he remains a spirited protagonist. He plows ahead with a plucky abandon determined to make a go of the hand he has been dealt. “I’m going to have to science the sh- – out of this” is his oft repeated quote. He relies on a combination of duct tape and disco. Ok so that’s not all, but the cheesy music ditties give the drama an air of ridiculousness. They even inform the story. From Vicki Sue Robinson’s “Turn the Beat Around” to Gloria Gaynor’s “I Will Survive” – what the timeworn selections lack in originality, they make up for in listenability. Try not and smile as he transports a radioactive isotope while grooving to Donna Summer’s “Hot Stuff”. I’d be rolling my eyes if it weren’t so gosh darn funny. 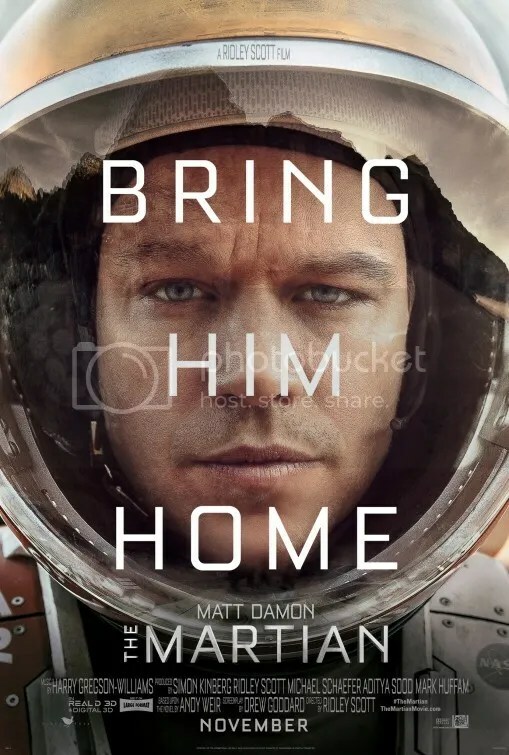 “Bring Him Home” is the tagline on the poster. That’s the objective and everyone gets involved – from China, who must declassify their own space program, to a science geek at NASA who comes up with a solution. The latter, who uses a stapler to dumb down his explanation for his superiors, is amusing for his condescending tone. The whole world is captivated by Mark Watney’s predicament. The Martian is simplistic in plot, but elaborate in experience. Breezy Hollywood hokum makes you feel good to be human. Sunny optimism never felt so cerebral.